America’s suburbs are not the homogenous places we sometimes take them for. Today’s suburbs are racially, ethnically, and economically diverse, with as many Democratic as Republican voters, a growing population of renters, and rising poverty. The cliche of white picket fences is well past its expiration date. The history of suburbia is equally surprising: American suburbs were once fertile ground for utopian planning, communal living, socially-conscious design, and integrated housing. We have forgotten that we built suburbs like these, such as the co-housing commune of Old Economy, Pennsylvania; a tiny-house anarchist community in Piscataway, New Jersey; a government-planned garden city in Greenbelt, Maryland; a racially integrated subdivision (before the Fair Housing Act) in Trevose, Pennsylvania; experimental Modernist enclaves in Lexington, Massachusetts; and the mixed-use, architecturally daring Reston, Virginia. Inside Radical Suburbs: Experimental Living on the Fringes of the American City you will find blueprints for affordable, walkable, and integrated communities, filled with a range of environmentally sound residential options. Radical Suburbs is a history that will help us remake the future and rethink our assumptions of suburbia. Early in the introduction to this, Amanda Kolson Hurley’s first book, she mentions NUMTOTs, a Facebook group that stands for New Urbanist Memes for Transit-Oriented Teens. I’m not a member of the group so not familiar with its content, but Hurley mines it for a discussion on “What bothers you the most about suburban life in general?” Having grown up in a suburb but lived all my adult, post-collegiate life in cities, I’m probably as critical of the ‘burbs as many NUMTOT members — and just as guilty at painting the suburbs (in my mind at least) as a singular condition: white, middle-to-upper-class, cul-de-saced, remote, monotonous, etc. But I know in my heart — having read a few books and many articles on the suburbs beyond Kenneth Jackson’s classic Crabgrass Frontier and, more importantly, seen my fair share of them — that the suburbs are just as diverse as the cities they border. Yet what I thought to be a contemporary condition, born from demographic and geographic shifts in recent decades, is also a historical one, assuming that Hurley’s six case studies of “radical suburbs” are just the tip of the iceberg. The six examples she explores span more than a hundred years, from the mid-1800s to the 1960s. Each suburb or suburban area fits into a theme, increasing the range of radicalness even as the examples are limited to the East Coast. There’s the anarchist Stelton Colony in New Jersey, for instance, as well as the Garden City in Maryland and a couple Modernist subdivisions near Boston. In each case Hurley delves into the history of the place, with research derived from visiting specialized archives (e.g. the Modern School Collection at Rutgers, with its documents on Stelton), in-person visits, and talks with residents. It’s a short and highly readable book that, even without illustrations, vividly paints pictures of places that further disrupt the view of suburbs in my mind’s eye. Furthermore, the case studies benefit from Hurley wrapping up each chapter with contemporary examples that, often to lesser degrees, embrace or continue the themes of those historical places. So while we don’t have anarchist subdivisions like Stelton, we do have more and more jurisdictions embracing ADUs (accessory dwelling units), which are linked to the secondary cottages or shacks that Hurley describes as a Stelton staple. 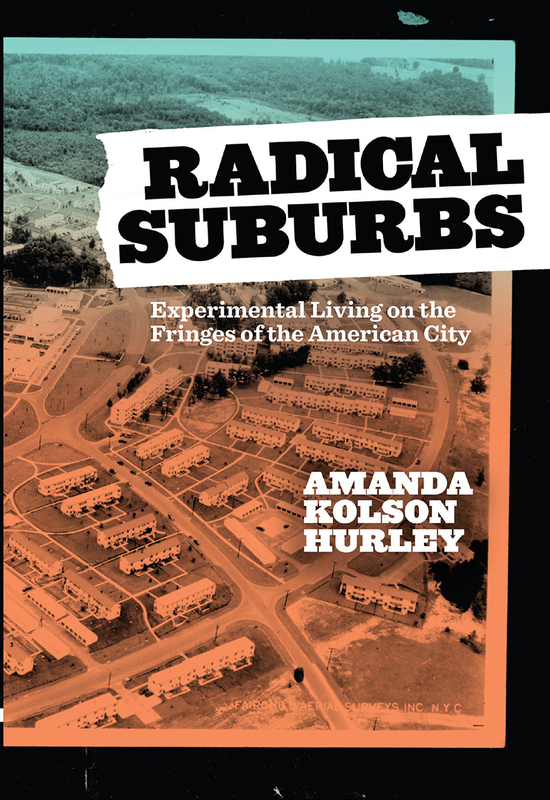 If Radical Suburbs leads to anything, hopefully it’s a loosening of the norms (the codes, covenants, and restrictions) that limit too many suburbs to the clichés we carry around in our heads. Amanda Kolson Hurley is a writer who specializes in architecture and urban planning and a senior editor at CityLab. Her work has appeared in The Atlantic, The Washington Post, Architect magazine, The American Scholar, and many other publications. She lives in Silver Spring, Maryland.